1 – Rams™ Licensed Beer Bucket. 4 – Rams™ Pint glasses. From Cleveland to Cali, from St. Louis and back to LA, there’s no question about it – the Rams have legions of loyal fans all across the country. And while they’re all different in their own way, there’s one thing that we’re pretty sure they all have in common – they’re all gonna love our Los Angeles Rams NFL Tailgate Bucket of Beer. Packed in a bucket with an LA Rams logo, this BroBasket includes four Rams pint glasses, four Rams coasters (no one likes water rings on a wet table), two beer koozies, and a reusable BroBasket bottle opener. We even tossed in a pack of Popcornopolis Popcorn, because aside from football, the only thing that goes better with beer is a salty snack. It’s obvious that this NFL gift is perfect for a tailgate party, but it’s full of cool things that he can use on any day of the year. The Rams bucket is ideal for holding a couple of beers or sodas on ice when you’re out in the backyard or relaxing on the beach. The pint glasses can be used for any beverage at any time. If you’re trying to hydrate, fill one with water – we won’t judge. The point is that when the beer is gone, he’ll have plenty of extras that he can keep and reuse over and over again. Rams gifts make great birthday gifts and holiday presents for loyal fans. But instead of giving him a jersey or a hat (true fans probably already have those), give him what he really wants – a gift that includes beer. 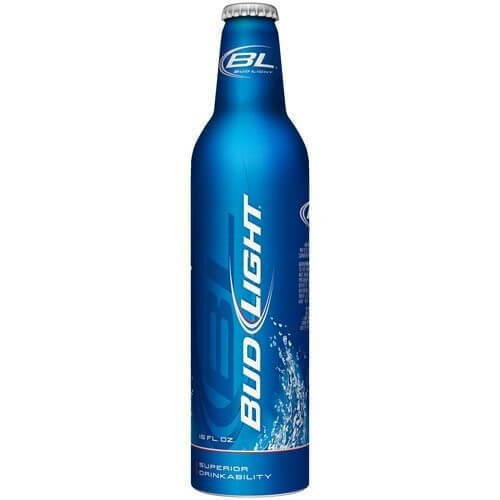 This BroBasket comes with 5 aluminum bottles of Bud Light – but if he’s not a Bud drinker, that’s okay – you can switch them out for a variety of other brands.